Bikkuriman Daijikai (ビックリマン大事界, Bikkuriman Daijikai? lit. Bikkuriman World) is a quiz game developed and published by Hudson Soft in Japan for the PC Engine Super CD-ROM² at the end of 1988. 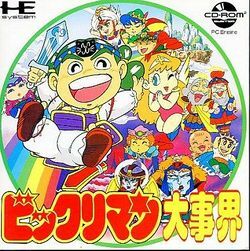 It was the third game released on CD-ROM for the system, after Fighting Street and No・Ri・Ko, and the second Bikkuriman game for the PC Engine, after Bikkuriman World. Bikkuriman Daijikai is less a game and more an interactive database of the various collectible stickers in the Bikkuriman series. In order to acquire more virtual stickers, the player must answer trivia questions based on the wider world of Bikkuriman, its anime series and other facts relating to the franchise. This unlocks special hologram "head" stickers as well as the next series of regular stickers. The player can also unlock special animated cutscenes that depict famous events in the series' fiction. As the third CD game for the system's new CD-ROM peripheral, developers Hudson were still experimenting with what was possible with the sheer volume of data that CDs were able to handle - almost two thousand times more than the Hucards that other TurboGrafx-16 games ran on. Bikkuriman Daijikai contains considerably more art assets than many console games available at the time, as well as high quality CD music. This page was last edited on 11 January 2017, at 03:33.